Whereby we tell the tale of Baby C.
Locked up in there, with her 4 and 6 year old sisters, and her mother. Her mother had been advised not to breastfeed, by her local NHS consultant. Something which pained the mother, who had breastfeed the elder two. Baby C, despite having excellent health prior to being uprooted from her home and driven in a minivan to Yarl’s Wood, suffered from repeat bouts of gastroenteritis and her weight gain faltered dramatically whilst in the compound. She was, finally, seen by a paediatrician at Bedford Hospital, on Monday June 30th. And who was placed on special, prescription only, elemental formula. And who then returned to Yarl’s Wood. And who then, two days later, was left without food for over 18 hours. No, you read that right. When the hospital supplied formula ran out, UK Borders Agency healthcare, provided by SERCOHealth, left the baby unfed for over 18 hours. So won’t be suffering from thirst, just hunger. How would you feel? How do you think Baby C, felt? Want to know what’s really shocking about this? It’s not the fact that the nearest tin of formula, was at Bedford Hospital, 3.7 miles away. It’s not the fact that they had over two days, and two overnight order opportunities, to order it from their nearest chemist, only 1.9 miles away. No, the really shocking fact.. is that they’ve accepted this happened, and that it was perfectly reasonable. And good standard of care. No problem here, pass along. We took perfectly good care of this baby in our charge. So go away and stop annoying us. That’s what your Government officials have said, in writing. This baby, already ailing, was left unfed for over 18 hours, and that’s perfectly okay. If you have an infant feeding qualifications, and your professional opinion differs from that of the experts employed by the UK Border Agency, Alison Blenkinsop, IBCLC would like to hear from you, pronto. The facts of this case are being circulated, and a towering rage of protest building – add your voice! If you are a UK citizen, and you have an opinion about this standard of acceptable care, please write your MP. If you’re not very good at letters, you may wish to have a look at the one below. And if, like me, you’re sitting here with tears in your eyes, wondering what that poor mite went through, with over 18 hours of salty sugar water with a fake blackcurrant taste… rest assured Baby C and her family are now out of Yarl’s Wood, back in their home town (although now homeless thanks to Borders Agency keeping her in Yarl’s Wood for over 28 days). We’re hoping to see her weight gain recover, and will keep you posted. I checked the Human Rights Charter on the right to food, you know. It doesn’t mention a thing about you being allowed out of it if the chemist is shut. 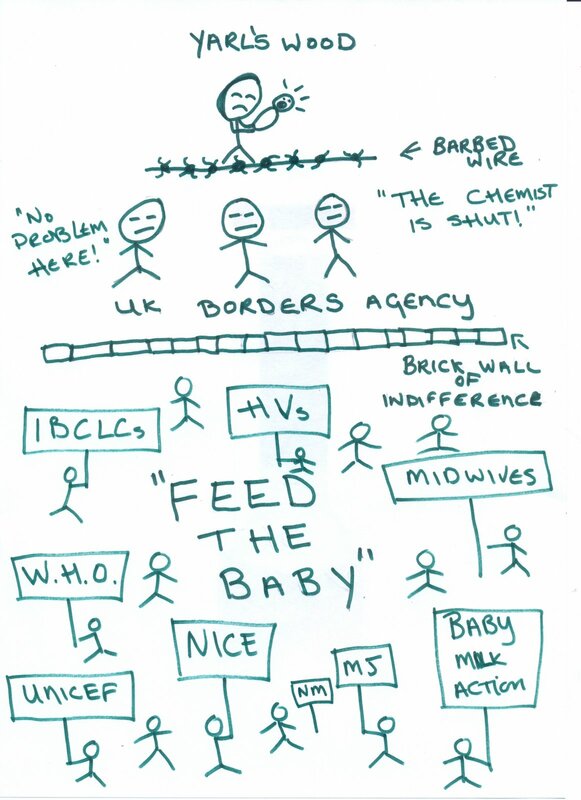 I’m writing to protest in the strongest possible terms about UK Border’s Agency views, expressed by Brian Pollett, Head of Detention Services, that it was perfectly acceptable to leave a 12 week old baby without food for over 18 hours at a recent incident in Yarl’s Wood IRC. I don’t care how much salty sugar water Yarl’s Wood supplied to this poor baby, not feeding it milk at all during this time was a completely unacceptable standard of care. I feel very strongly that UK Borders Agency should accept that this was a terrible incident, and should promise to ensure that it never happens again. As my MP, I’m asking you to contact Liam Byrne’s office and pass on my complaints directly. It is totally unsupportable that Government agencies should defend the indefensible in this manner. I look forward to an early reply from your office. I emailed my MP about this , using your letter. I got a House of Commons letter from him through the post today, saying he had passed my concerns onto the relevant minister and would let me know when he gets a satisfactory reply. Excellent. We have had some positive repsonses from MPs. Which is probably why I received an invitations today, to attend a meeting at Yarl’s Wood, with Borders Agency managers and Serco staff, to discuss the issue. Alison Blenkinsop has also been invited. So I will keep everyone updated.Letters to MPs do work, when clear and accurate info is given! :-)Meeting will probably not be until late Sepetember, but I will keep everyone updated, as I said. Wow Morgan, I have only just read about this. I am a UK citizen overseas, so unfortunately I only hear about the atrocities in the country I reside in. I am so happy to see that you are taking these steps. I am being visited this coming weekend by a good friend of mine who had a clinic in the north of England specifically for refugees and the horror stories he told beggar belief. Keep up the good work!